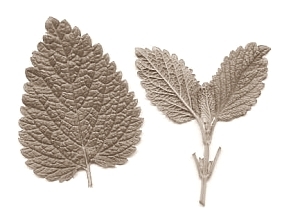 Herbalists in Europe have used extracts of Melissa officinalis – common name lemon balm – as a sedative and memory improver since the Middle Ages. In the sixteenth century Paracelsus wrote that Melissa officinalis was effective against "all complaints supposed to proceed from a disordered state of the nervous system". The researchers were not able to work out exactly how Melissa officinalis works. They did discover that the herb doesn't inhibit the enzyme cholinesterase. What is known is that unknown compounds in the herb attach themselves to the nicotine and muscarine receptors in the brain. These receptors are intended for the neurotransmitter acetylcholine. The Brits suspect that Melissa officinalis contains substances that can help fight Alzheimer's. Hundreds of years ago European traditional healers suspected that frequent use of Melissa officinalis made people live longer and remain disease-free at the same time.